Green Day’s lead singer started his music career back in the early childhood, boldly walking the road from a young performer of songs from Broadway musicals to the voice of St. Jimmy and Jesus of Suburbia. He plays Blue, he sings loud and he knows how to speak his mind. Billie Joe Armstrong was born on February 17th, 1972 in Rodeo, California as the youngest of six children in the family of Ollie and Andrew Armstrong. His parents and siblings have introduced him to music which became a major part of his life from early childhood. This served as a path not only to his successful carrier in show-business, but also to the creation of his own family. He met his future wife Adrienne Nesser during a tour with his band when they stopped in her hometown Minneapolis, Minnesota. Armstrong and Nesser got married in 1994 and now have 2 sons - Joseph and Jakob. As said before, young Billie Joe was interested in music right from the start and recorded his first song called Look for Love at the age of 5. That was a recording for a local label Fiat Records and was only a beginning of his way towards worldwide fame. As a child, Armstrong was often singing in hospitals, which gave him great experience as well as broadened his musical outlook since he had to sing songs from musicals and other types of songs he would have never performed otherwise. First he learned to play the piano and then at the age of 10 he got his first guitar as a present from his father - that was the famous "Blue", which has become a legend over the years. With the development of his career, Armstrong acquired more and more instruments and equipment and now owns a variety or different guitars, as well as a few copies of Blue itself. When young Billie Joe Armstrong and Mike Dirnt formed their first band called Sweet Children it was only a local band that wasn't much different from dozens of others like them. However, they obviously had enough talent to get themselves a record deal and eventually get signed on a major label. As a songwriter and member of Green Day, Billie Joe Armstrong has become one of the most influential people in punk rock music. However, his career is not limited to Green Day only. He has various side projects as well as his own label Adeline Records which he created with his wife Adrienne. Aside from that, the musician also tried himself in acting - he played the leading part in a controversial puppet movie Live Freaky! Die Freaky! All of Armstrong's show-biz achievements are only a part of what attracts attention to his life and career. Ever since Green Day became famous, the band's lead singer and guitarist has been adored and desired by thousands of people not only because of his talent, but also because of his looks. His green eyes and unforgettable facial features along with constantly changing hair-styles and countless tattoos have been a source of endless interest and fascination for Armstrong's fans and groupies. However, you don't need to be madly obsessed with him to realize that his tattoos are truly amazing in their variety and quantity. Lately, Green Day have become a lot more peaceful, grown-up and wise. They no longer act like brainless kids that punk rock is commonly associated with. However, they've always identified themselves with punk, not only in music, but also as a life style. As well as his band mates, Armstrong has done a lot of crazy things which left a mark not only in the history of punk rock, but also in his medical history. From starting the notorious mud fight to falling off the stage - Billie Joe and the band have caused and experienced quite a few accidents throughout their career. Each next album or project reveals a new side of Armstrong's talents, as a songwriter, lyricist and even actor. Surely he has a lot more to give, and we will soon see what it is - all we need to do is wait for the next step he takes in his amazing career. His musician soul was unveiled pretty early. While other kids were pulling each others' hair, he was 'looking for love'. 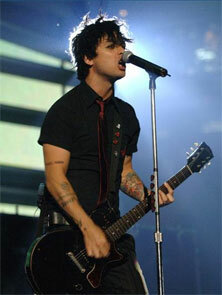 As it's known (or it's about to be for those who don't know), he's the lead singer (guitar, vocals) for Green Day. Yeah, the one whose guitar is simply called Blue and whose favorite non words are 'Hey Oh'. I'm sure he'd agree with that. Mike's screaming skills were recognized long before the beginning of a Green Day era. So were his bass playing skills. This intro leads to his band position which is a bass player. So is screaming but occasionally. His hard childhood didn't bring him down. On the contrary, he let music lead him, he let it be his life. Taking a look at him now, we may say, he chose the right thing. Once upon a time Tre was destined to be a drummer. Nowadays, he still fulfils a prophecy. It's all clear, he rocks our world by playing drums. His fame came along with his song called 'All By Myself' where he represented his nightingale voice. If you see him around the corner, don't fear, he's looking for food.